Why, after all this time, are you launching a monthly lens? You mentioned that this lens is designed for monthly wear. What do you mean by that? Can you tell us more about the results from the ACUVUE® VITA® clinical study? When some doctors hear “lipid integration,” they get concerned about lipid deposits. Is this something that doctors should be concerned about with ACUVUE® VITA®? 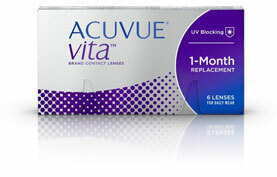 What are the additional features that ACUVUE® VITA® will provide to the patient? ACUVUE® VITA® Brand Contact Lenses are indicated for vision correction as a daily wear lens with one-month recommended replacement. As with any contact lens, eye problems, including corneal ulcers, can develop. Some wearers may experience mild irritation, itching or discomfort. Lenses should not be prescribed if patients have any eye infection, or experience eye discomfort, excessive tearing, vision changes, redness or other eye problems. Consult the package insert for complete information. Complete information is also available by visiting acuvueprofessional.com, or by calling 1-800-843-2020.